The Appaloosa is a horse breed originated in the United States, and the original American breed was developed by the Nez Perce. The Appaloosa was known by settlers as the Palouse Horse, perhaps after the Palouse River which ran through Nez Perce territory, and the name evolved gradually into Appaloosa. 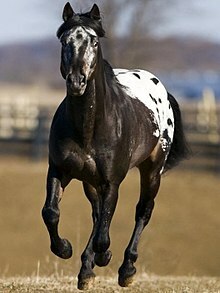 The Appaloosa horse is a breed recognized for the colorful spotted patterns on its coat. It varies from the leopard coat, a spotted Dalmatian-like pattern, to a few-spot leopard coat or a ‘blanket,’ a ‘snowcap’ of spots. Most representatives have mottled skin and striped hooves, and when the eye is in normal vision the sclera, or the white of the eye, is visible. The Appaloosa horse is currently one of the most popular horse breeds in the United States. In 1975 it was named the official state horse of Idaho, and the Appaloosa has been in many movies and is the mascot of the Florida State Seminoles. The bloodlines of the Appaloosa have influenced other horse breeds, among them the Pony of the Americas and the Nez Perce Horse. The Appaloosa is used chiefly in western riding disciplines, but it is a versatile breed which has adapted to other kinds of equestrian activity. The registry of the modern breed allows the addition of some American Quarter-horse, Thoroughbred, and Arabian horse blood. The weight of the Appaloosa horse ranges from 950 to 1,250 pounds, and the original breed of Appaloosa was a tall and narrow-bodied horse and rangy horse. According to the ApHC (Appaloosa Horse Club), the Appaloosa is favored to be a reliable family horse and has an easy-going disposition. An interesting and informative post! Very interesting. Do you know how the Nez Perce developed this horse? Since most of the North American horses came from horses brought by the “invaders” from Europe could the Appy have some Knabstrupper ( spelling?) in its ancestry? I think the Nez Perce crossbred some horse breeds and got the Appaloosa breed. The Appaloosa breed has the blood of a lot of other horses, including the Knabstrupper. Unfortunately some of the negative traits I’ve observed in Appaloosas are: skin sensitivities, eye and vision problems (including night blindness from birth, moon blindness and overall bad vision), and a very stubborn nature. Of note, they also can require more drugs to knock them out for veterinary procedures. It’s awesome that you own appaloosas, what a coincidence! 🙂 I’m glad that you like them.